Staf photo by Steve Muscatello New Ulm pitcher Braden Zimmerman tosses a pitch during the Eagles’ win in the first game of a doublheader against Waseca Thursday at Mueller Park in New Ulm. NEW ULM — Hunter Ranweiler, Tyler Roufs and Sam Berg each had an RBI single in the top of the seventh inning to break open a close 9-8 New Ulm lead into a 12-8 cushion as New Ulm remained unbeaten in the Big South Conference with a 12-8 win over Waseca Thursday night in the second game of a doubleheader. New Ulm won the first game 9-1. Berg, Jaden Domeier and Luke Scheid each collected three hits in the win, with Domeier driving in four runs. 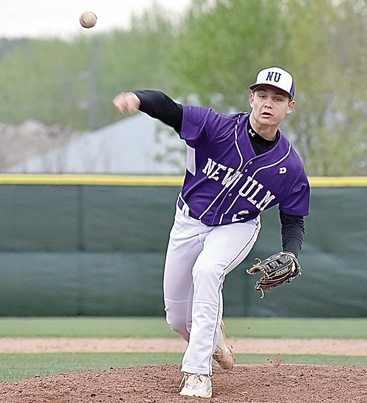 Brandon Seidl got the win in relief for New Ulm, now 9-0 in conference play and 11-1 overall. Seidl took over for starter Jack Fairbairn, who went 2 1/3 innings and was making his first varsity start. 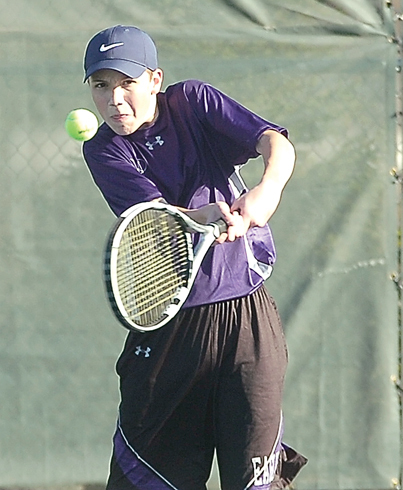 Matt Olson took the loss for Waseca (1-6; 2-7). New Ulm had built a 4-0 lead behind the Fairbairn for two innings, using RBI singles from Berg and Domeier in the first, a Scheid RBI double in the second and a top-of-the-third Domeier RBI single. But Waseca scored three runs in the bottom of the third, chasing Fairbairn. Both teams continued to score, with New Ulm scoring two runs in the fourth on an error and a Berg RBI single. The Eagles added a run in the fifth, but Waseca added three runs in the bottom of the fifth to tie the game at 7-7 off of Seidl. “He (Seidl) has been money, but he was extended in innings today,” Briggs said. A two run single from Domeier in the sixth gave New Ulm a a 9-7 lead before Waseca cut the lead to 9-8 in the bottom of the inning. New Ulm then scored three runs in the sixth to secure the win. In the first game, New Ulm took advantage of 12 walks by Bluejays pitchers — including six in a five-run sixth inning — for the 9-1 win. Braden Zimmerman got the complete game win for New Ulm. He struck out six and scattered five hits. Berg had three hits and drove in three runs. T.J. Sweere added two hits. Briggs said he was pleased with Zimmerman’s day on the mound.